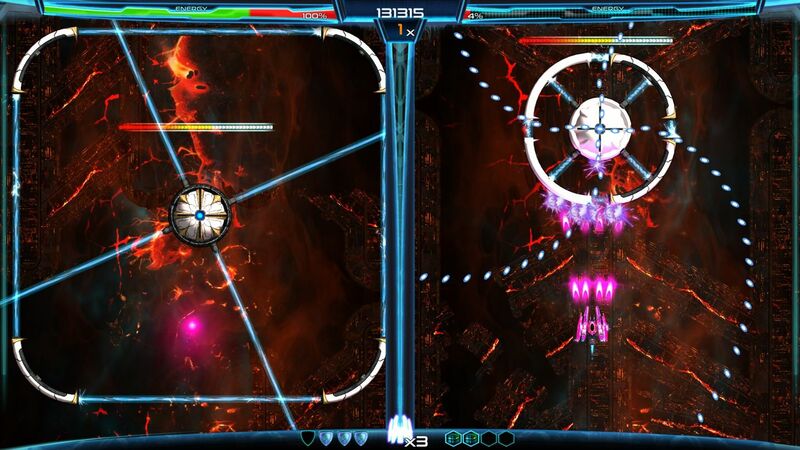 There is nothing new about the vertical shooter, but what 2Awesome Studio and LBC Games have done with Dimension Drive sees it try to stand out from the crowd. But how? Well, by doing away with the generic mindless shooting usually associated with a game of this type, and throwing in a mechanic that sees you playing across two separate screens. At the same time. And it is exactly that which sets Dimension Drive apart from its rivals. But is that a good thing? Well, yes it is, but there are times within Dimension Drive when you’ll need to put your fast reacting shooting skills on the backburner to instead focus on some slower paced puzzle-styled action. Dimension Drive tells the tale of Jackelyne Tywood – Jack to her friends – the only surviving member of her race. See, friends and family of Jack were wiped out by the evil Ashajuls, a species who has managed to conquer the galaxy to turn each and every one of their subjects into slaves of the war machine. But Jack escaped along with her personal AI, V.E.R.A., and after being found floating aimlessly inside her ship, The Manticore, it is time for Jack to stop running, and instead fight back. If only to avenge the deaths of those she knew and loved. Thankfully the Manticore is a fully capable ship, one that comes with not only plenty of firepower, but also the addition of the Dimension Drive, letting it and its occupants flick between dimensions with ease. 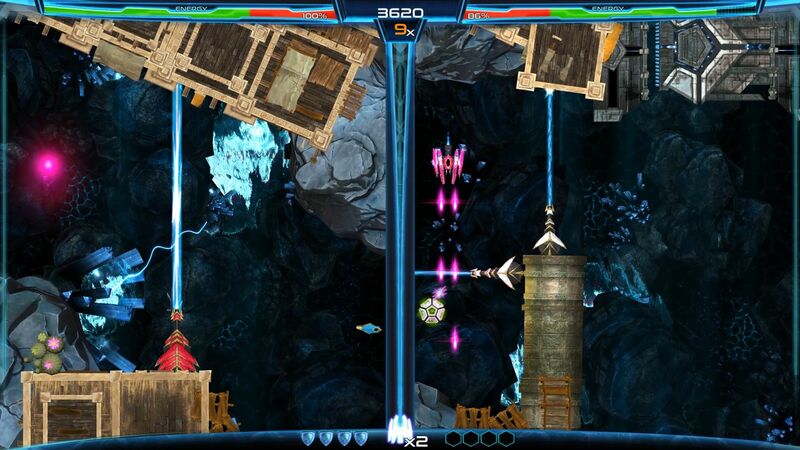 It is this unique ability which takes centre stage in Dimension Drive (the game), turning what would otherwise be a short shooting experience, into something a little different. It all runs as you might expect and after taking in some rather decent narrative based comic book strips that set the scene well, the main action is pretty fast and reasonably hard. Running vertically from bottom to top, you’ll just be left to navigate your way through each and every one of the levels put before you, progressing the tale of Jack and V.E.R.A. and ensuring that the Ashajul are put in their place. Plenty of enemy crafts will be in your way, and the variety of obstacle found in each stage background provides more of a test, but whether you are intent on firing, or prefer to take the slightly more stealthy switching approach, a variety of tactics works in Dimension Drive. Obviously the main draw is the fact that you can switch between two different planes with a quick hit of a button, and this is something you’ll be doing constantly throughout your time with Dimension Drive. See, each side of the screen is different from the other, and whether it is a jump to the right that is required because an impassable obstacle is in the way on the left, or a move in the opposite direction just because your weaponry and energy cells have been depleted from firing on the current side, the movement between the two is an essential part of things. You’ll also need to switch in order to shoot various switches which in turn open up pathways on the other side, or just because the draw of trying to grab a weapon upgrade is too much to turn down. Whatever the reason though, it’s an easy enough process to jump from one side to the next, and back again, in quick succession without a single hitch. There are even a number of Achievements sitting ready to unlock once you have made the jump numerous times – that is how important the whole mechanic is to how Dimension Drive works. To mix things up a bit, each stage contains a number of segments that see checkpoint placements utilised, before the occasional boss battle attempts to rid the galaxy of Jack for one last time. For the most part the entirety of the gameplay is straightforward enough, and this is similarly true for the bosses; once you’ve managed to get your head around the main dimension jumping mechanic, and understand how each of the bosses attack, will find yourself sailing through with relative ease. Expect to die a few times whilst you try to get a grip on things, but the short, sharp nature of each of the worlds, and the levels found within, mean that any death is no massive deal. In fact, due to the short nature of things, should you be some kind of dimension hopping ninja who gets to grips with everything that Dimension Drive delivers from the get-go, you’ll probably have reached the main story conclusion in just an hour or so. That said, there is nearly always a reason to go back in for more. 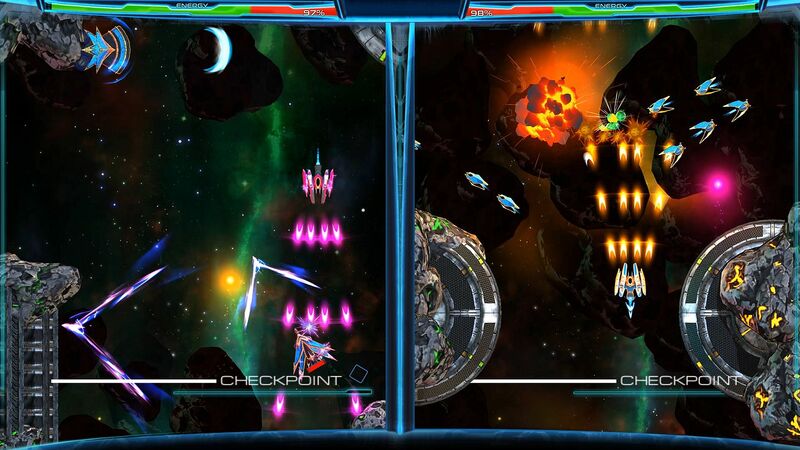 As is very much the way with many shooters, upgrading your ship to be able to cope with the multitude of enemy types that come at you is par for the course with Dimension Drive, and even though there are a number of in-play weapon and shield upgrades that can be picked up as you go about things, going all out to expand the Manticore’s weaponry is very much an essential part of the game. This is done by collecting Data Cubes, which in turn unlock more weapons, allowing you to ditch the standard cannon for the likes of long range energy pulses, plasma streams or close combat shredders. Each work well but much of the draw of any shooter is, at least in my opinion, the chance to pile as many fast firing bullets foe-wards as possible, and in that instance the very first weapon you have access to more than does the job. It’s always nice to be able to experiment though. 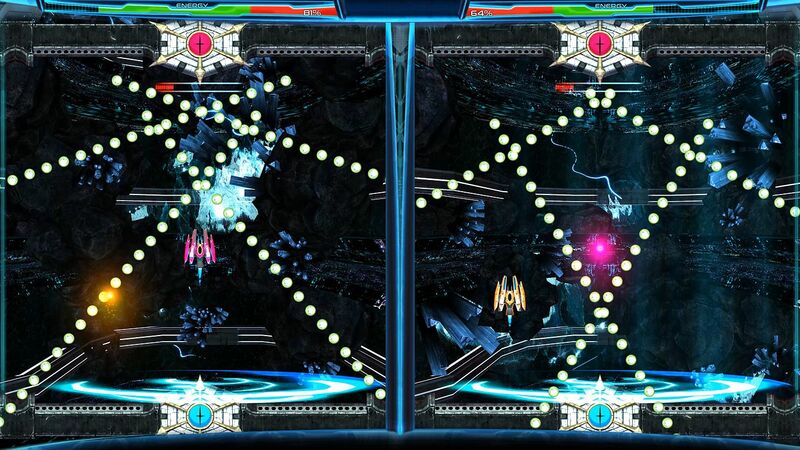 A couple of extra abilities also open up the more you play and to go alongside the Manticore’s Dimension Drive is a Reverse Drive which lets you slow down your ship and put it in to reverse so that you can shoot things behind you, and the Drift Drive which allows for shifting from left to right with utter ease. It’s a shame that these don’t really need to come into play all too often though, especially not in the three-world, 13-stage spanning campaign. That said, taking to the galactic battlefield with a local mate alongside you does give even more reason to experiment a little, and whilst the cooperative campaign isn’t as addictive as that found for the solo shooting fan, it all works as it should with the usual Dimension Drive flow always pushing things on. There is the inclusion of the Lost Levels too, and these are basically three extra missions which see Jack going up against all manner of foe – with as much firepower and as many abilities as she wishes at hand. It’s a great way of being given free rein instead of needing to live by the weaponry limitations found in the main tale. Dimension Drive is fluid at all times, fast when it needs to be, and clever enough to be able to integrate in the unique dimension hopping feature to ensure that it is something many fans of the genre will want to get hands on with. It’s not the lengthiest experience you’ll ever take in, and occasionally the dimension swapping nature overpowers the shooting goodness that should be front and centre, but heading back in to collect Data Cubes, attempting to place higher on the global leaderboards or to try your hand on a more insane difficulty will ensure that this isn’t a game that you’ll be done with in a single day.